Listening is a very important skill, especially when it comes to conversation. As humans, as performers, our ability to talk, listen and interact in conversation is central to our communication with each other, through language, sound and importantly silence. For this work I wanted to use my own voice and narrative to encourage conversations with shopkeepers across Melbourne. I wanted to record our conversations, the pauses, the murmurs, the questions, the answers, the confusion and the laughing. I entered shops on Smith Street, Collingwood, and asked a simple question. “Excuse me, do you have any Gold?” and then recorded the improvised conversation that followed. From sports shops to two dollar stores, I performed my conversation based on the premise that I was looking for gold, to buy solid gold, regardless of the shop I was in. I received a range of responses from general politeness to bewilderment right through to hostility. All I had to do was try to remain composed and serious, as if I genuinely needed Gold, and I had to remain internally convinced that the shop I was located in had gold somewhere in there shop, whether this be in the store front or the storeroom at the back. 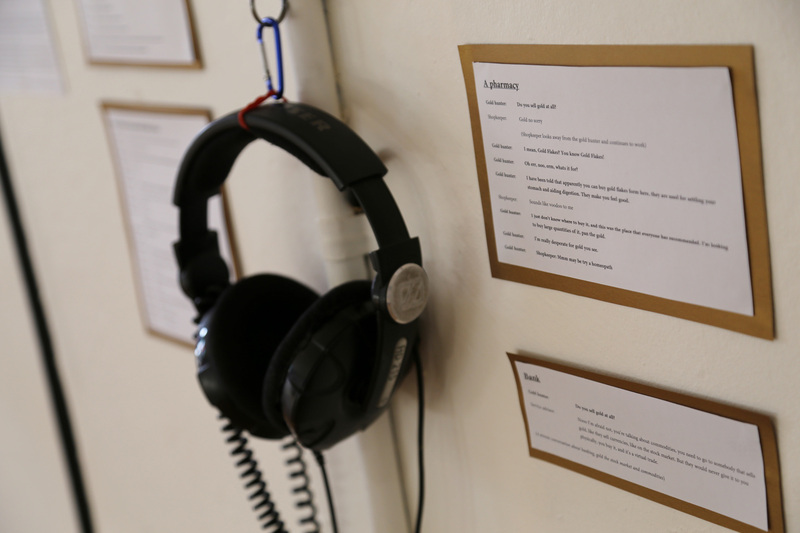 The work is presented as text art – a selection of written transcript from the recordings, along with a selection of audio clips.